Yes, we know the theory goes that flatpacked furniture is meant to make life easier for everyone. Until you have to assemble it, of course. So how would you feel about flatpacked kids’ furniture that doesn’t even require an allen key? Pretty good, I bet. From brand new Canadian company Toytoy comes a line of kids’ furniture designed to be strong, ecologically responsible, visually striking and, best of all, reasonably cheap. First off the mark is their children’s armchair, launched in Canada this month. It comes in three colours, three sizes and it even has a waterproof coating – important, because it’s made of recycled cardboard! Each armchair is made from a sheet of precut recycled cardboard and comes with instructions for easy assembly – there’s no gluing or cutting required. 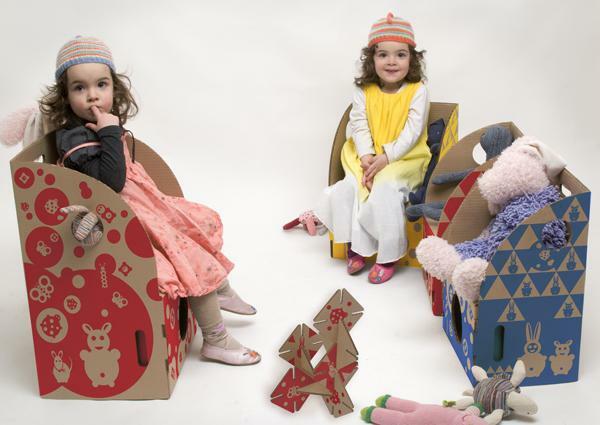 The designers have focused on simple geometric shapes which appeal to young children and the chairs even have a storage compartment for keeping little treasures. The best selling point is definitely the price – only CA$19.99. The worst bit? Toytoy unfortunately do not ship direct to Australia at this stage but we’ll keep you posted.